One of the biggest challenges facing contractors and DIYers working at height can be operating in a tight space. It is an absolute must to stay safe but what happens when the area is so small you can’t even get your podium steps through the door? Here is the solution. Our narrow podium steps can help you deal with all those hard to reach areas quickly and easily. This compact, versatile piece of kit even fits through a standard door frame which means you can put safety first while working at height both inside and out. Working with the right equipment at exactly the right height for the job is known to aid efficiency and the quality of your work not to mention helping you to save both time and money. We can provide you with a wide variety of different narrow podium steps and accessories perfect for any task and you can be sure that all our equipment is checked, maintained and pressure washed after every job so you know it is in tip top condition and ready for action. 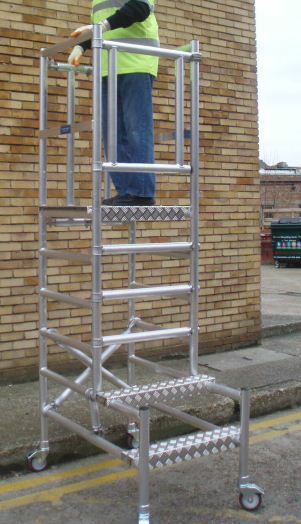 It takes about 15 seconds to set up our narrow podium steps and the equipment is suitable for use just about anywhere. Call us today and your podium steps hire will be on site tomorrow.